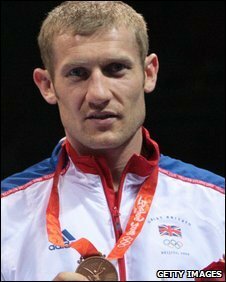 Olympic bronze medallist Tony Jeffries will become the first Beijing star to fight professionally when he meets Aliaksandr Vayavoda on Friday. Jeffries, 23, goes up against the Belarussian over four three-minute rounds in the super-middleweight bout in Barnsley and cannot wait to fight. "It's what I've been dreaming about for so long and Beijing seems such a long time ago now," said Jeffries. "It's going to be a very special night making my debut in front of my fans." The Sunderland boxer signed up to Frank Maloney's stable of fighters at the beginning of February. His debut comes on the undercard of Rendall Munroe's European super-bantamweight title defence against Spaniard Kiko Martinez. Will Jeffries impress on pro-debut? The step down has meant a tough training schedule to ensure he meets the weight requirement, and Jeffries has not ruled out moving back up to the higher weight in the future. "I'm going to see how I feel then discuss it with Frank and my trainers," he added. "I'm quite big for super-middle but I'm feeling good and I think it's where I'd like to stay. "Hopefully with the right training and the right diet I'll be able to get down to 12 stone and stay there."